Iranians supporting a military strike against their own country are brazen and hypocritical. 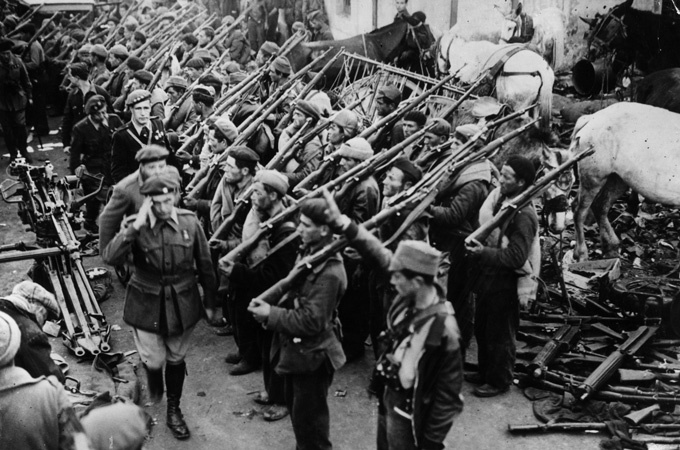 New York, NY – The term "Fifth Column" is believed to have been coined in 1936 by Emilio Mola y Vidal (1887-1937), a nationalist general during the Spanish Civil War (1936-1939), as his army of four columns was approaching Madrid, and he said that a "Fifth Column" would join them from within the city. Ernest Hemingway's The Fifth Column and the First Forty-Nine Stories (1938) is a homage to that coinage. The expression has ever since developed to mean the militant supporters of an approaching enemy that would aid and abet them – or give them "aid and comfort", as the Article III Section 3 of the US Constitution delineates "treason" – once they enter their target destination. In the age of globalised imperialism and the chimerical creature called "humanitarian intervention", we now seem to have chanced upon a renewed conception of the "Fifth Column" one might venture to call "postmodern". The question that the term now raises is where precisely does noble opposition to a tyrannical regime end, and treacherous collaboration with belligerent warmongering against one's own people begins. Three consecutive and dramatic events – the NATO military intervention that led to the downfall of Gaddafi, the renewed Isareli bellicose warmongering against the Islamic Republic of Iran, and the spin that US and Israel put on the IAEA report about the Iranian nuclear programme – have all come together to give rise to this new mode in the formation of a "postmodern Fifth Column" that is now winking and elbowing to entice and encourage the US and Israel to invade Iran. This emerging band of Iranian Fifth Columnists took their crudest clue from two back-to-back interviews that US Secretary of State Hillary Clinton gave to Voice of America and BBC Persian programmes in October 2011, in which she said the US would have helped the Green Movement if they were asked to do so. Their palates salivating since the NATO military intervention in Libya, these Fifth Columnists went positively gluttonous at the idea and soon got to work on the project. Some of their most brazen and hypocritical have openly asked for the US to invade Iran (one of them claiming that the annual traffic and even cancer statistics in Iran would be less than the casualties of a potential war, while another uses creative accounting with the low number of civilian casualties in Libya), while others are using convoluted Orwellian Newspeak of the crudest kind hoping to camouflage their treachery. Those who have openly asked for military strike (aka "humanitarian intervention") a la Libya against their own homeland are beyond redemption. I have very little to say about them, for history itself is a harsh and unforgiving judge. It is this latter group – the Orwellian Newspeakers – I have in mind when I refer to them as "postmodern Fifth Columnists". In order to get their mission accomplished, what these postmodern Fifth Columnists have been doing is to start loosening the solid screws of certain key concepts, making them less trustworthy and reliable. They create confusion and chaos in the minds of people they target by way of paving the way for a military strike against Iran, presenting it as something good and liberating: not a military invasion, but "a humanitarian intervention". First in Libya, they say, then in Syria, and then ("perhaps, no I did not quite say that, did I, but should the circumstances demand, yes why not") Iran. Their manner of speech is in fact quite pre-Orwellian and entirely akin to Lord Polonius instructing Reynaldo as to how to spy on his son Laertes without appearing to do so: "See you now; / Your bait of falsehood takes this carp of truth: / And thus do we of wisdom and of reach, / With windlasses and with assays of bias, / By indirections find directions out …"
If you pardon the crudity of their diction and bear with their pedestrian politics and prose, what they do and say is the Orwellian nightmare all over again: They issue a statement calling it "against war", which in fact paves the way for war. As Orwell would say, "war is peace, freedom is slavery, ignorance is strength" – all to the letter of the insight: Orwell’s prophetic soul! The Orwellian Newspeak puts a new spin on reality in their prose and politics. In a statement that they issue against war they in fact say that the threat of war is not that serious, and that even warning against it is treacherous to the cause of liberty in Iran. And they do so with a straight face. As Syme would say: "It's a beautiful thing, the destruction of words." Their verbiage, double-talk and speaking from both sides of their mouth is of course not lost on careful and caring readers who have point by point dissected (in Persian) their position and exposed their hypocrisy. They repeat the mantra that Iran is a threat to world peace, the singular line of Israeli propaganda machinery, as if Israel is the singular source of peace and serenity for this world. Meanwhile, they beat the drum of war against Iran, all the while calling their statement "against war". The Orwellian Newspeak is no longer merely obscene. It is clinically deranged. As a key example, these postmodern Fifth Columnists have started playing tootsie with the idea of imperialism: There is no longer any imperialism, they insist. This is "an old discourse" (they love the Persian word coined for "discourse" – gofteman – so much that they keep using, abusing and misusing it). Imperialism was something of the past, and only the retarded leftists keep reproducing it uselessly. Meanwhile, some of these Fifth Columnists used to be militant Stalinists in their youth. But now, having moved from Tehran to Tehrangeles, imperialism looks démodé, out of fashion: The US army is out vacationing in Afghanistan, Iraq, Pakistan, Yemen, Libya, Somalia, all around the globe. The US has upwards of 700 military bases around the globe, as the late Chalmers Johnson so painstakingly documented, including their 234 military golf courses scattered all over the world, simply for entertainment purposes. Literally hundreds upon hundreds of books and articles detailing the specific contours of US imperialism – most recently the three volumes of Chalmers Johnson's Blowback Trilogy – are just non-existent, for "ignorance is strength". Quickly connected to this cavalier dismissal of imperialism as a global phenomenon, these postmodern Fifth Columnists also say that "national sovereignty" and "independence" no longer means anything. Wake up and smell the globalised postmodern roses, they say. Countries like Iran (or Iraq, Afghanistan, Libya) no longer have any claim to their own territorial integrity as a site of potential resistance to predatory capitalism. Nationalism is tribalism, and this tribalism has made a monster out of "the West", they insist. While rebelling against homegrown tyrants, the poor inhabitants of these countries have (entirely unbeknownst to themselves, but discovered by these postmodernists in Tehrangeles) also lost any claim of sovereignty over their own homeland. "I am sorry, then," they say along with Burgundy to the poor Cordelia of these unfortunate nations. "You have so lost a father / That you must lose a husband." If they lack democracy as approved by the US National Endowment for Democracy (NED) they have no claim to national sovereignty either. Some create a boogeyman out of "colonialism", a word which these expat professors navigating their SUVs between one college campus in California and another always like to put into scare quotes. So no, colonialism does not exist. Palestinians are just having fun with the humanitarian intervention of Zionism into their living rooms. No sir, from Fanon to Said to Spivak – from Jose Marti to W E B Dubois to Malcolm X, from Mahatma Gandhi to Aimé Césaire and Léopold Sédar Senghor: They were all boogeymen frightening folks out of their wits. "Ignorance is strength"? No sir, ignorance is bliss. There is no colonialism, no imperialism, no national sovereignty – these are all fictions that "old lefties" have made up. To crown these pieces of rare jewellery, these postmodern Fifth Columnists celebrate the idea of "humanitarian intervention". No, they insist, this is not a military strike, nor is it imperialism. It is "humanitarian intervention" – just as the US and NATO say it is, from which sources these good folks take their cues. The link between knowledge and power has scarce been more at a gunpoint. Not that these folks care to read anything beyond their own statements – but nevertheless: In Reading Humanitarian Intervention: Human Rights and the Use of Force in International Law (2007), Anne Orford goes back to the 1990s, almost two decades before the Libyan uprising, when "humanitarian intervention" first posited as a move beyond imperialism and national sovereignty. Anne Orford demonstrates in exquisite detail how this very "humanitarian intervention" was in fact a ruse for very old-fashioned imperial designs in a new register. Bringing feminist, postcolonial, legal and psychoanalytic theory together, Orford took the bogus notion of "humanitarian intervention" to task on legal and political grounds. In Saviors and Survivors: Darfur, Politics, and the War on Terror (2009), Mahmood Mamdani too took the crisis in Darfur back to the historical context of Sudan, where the conflict in fact began as a civil war (1987-1989) between nomadic and peasant tribes, triggered by a severe drought that had expanded the Sahara Desert. Mamdani then links the conflict to how the British colonial officials had in fact artificially tribalised Darfur, dividing its population into "native" and "settler" tribes – very much on the model that Nicholas Dirks demonstrates in his Caste of Mind how the British recast the caste system for their own colonial interests. The involvement of the Sudanese opposition parties gave rise in 2003 to two rebel movements, leading to a brutal insurgency and counterinsurgency. The Cold War then exacerbated the civil war in neighboring Chad, creating a confrontation between Gaddafi and the Soviet Union on one side, and the Reagan administration, allied with France and Israel on the other, moving into Darfur and violently exacerbating the conflict. By 2003, Mamdani demonstrates, the war involved national, regional and global forces, including the US and Europe, who now saw the conflict as part of "the War on Terror" and called for a military invasion dressed up as "humanitarian intervention". All such historical facts on the ground were categorically whitewashed under the jazzed-up urgency of "humanitarian intervention". Stanley Motss/Dustin Hoffman of "Wag the Dog" (1997) could not have produced the scenario any more lavishly. When making a case for the military strike against Libya, even President Obama saw the hypocrisy at the heart of the operation when Bahrain and Yemen (as the most glaring examples) were so loudly calling for comparison. President Obama sought to explain the cherry-picking in terms of the coincidence of American "values" and American "interests". But these Iranian "humanitarian interventionists" are even blunter than the American president in seeing no innate contradiction in their hypocrisy. If you were to take New York buses these days, you may notice from your windows that New York cabs have recently started sporting advertisements for "New York Dolls" available at "Gentlemen's Clubs". It must be something in the air: Why call bordello houses bordello houses when you can call them "Gentlemen's Club" – or call imperialism by its name when you can call it "humanitarian intervention"? Bordello houses and imperialism are really very old and cliché "discourses" – "Gentlemen's Club" and "humanitarian intervention" are far gentler and kinder Newspeaks. Another gimmick of these postmodern Fifth Columnists is to try to silence their opposition by accusing them of being agents of the Islamic Republic – not a very imaginative trick, you may think, but nevertheless seemingly effective in the infested pool of exile communities. If you were ever to dare as much as utter a word against these inanities they weave together, then you must be a paid agent of the Islamic Republic. That people who object to their inanities have served repeated jail terms in the dungeons of the Islamic Republic, who have gone to the brink of death and come back during their hunger strikes, have written against Khamenei and the Islamic Republic while in Evin prison, that there are people opposed to their warmongering who have barely escaped from the firing squad of the Islamic Republic, people whose parents have been butchered by the agents of the Islamic Republic, makes no difference to these valiant motorists daring the elements of the DuPont Circle and Los Angeles highways. "Some of these people have never been as much as slapped once in their lives," said Akbar Ganji recently in an interview. Ganji is perhaps the most prominent human rights activist who opposes waging war against Iran. "And they call people like me agents of Islamic Republic." After his youthful attraction to Muslim revolutionaries in the late 1970s, Akbar Ganji emerged as one of the most courageous investigative journalists and human rights activists of his generation, exposing the criminal atrocities of the Islamic Republic, a feat that has twice landed him in the dungeons of the theocracy for more than six years, led almost to his death after a prolonged hunger strike, and for which he and his family continue to pay dearly. What representational legitimacy that the pro-war (excuse me, pro-"humanitarian intervention") advocates lacked, the Wall Street Journal was happy to manufacture for them in a quick fix by implicating the dissident voices inside Iran – a gimmick that did not quite work when Akbar Ganji gave chapter and verse from the specific positions of major oppositional voices inside Iran (some in fact from inside the notorious Evin prison) against military intervention. Even before Akbar Ganji, the former Iranian President Mohammad Khatami had very specifically said that should there be a military strike, the Reformists and non-Reformists will be united against any harm coming Iran’s way – a fact that even Haaretz reported to its Isareli readers, but escaped the attention of these warmongers. There is a vast and insurmountable difference between being opposed to the criminal atrocities of the Islamic Republic and becoming the Fifth Column of an US/Israeli design on Iran. The postmodern Fifth Columnists have confused the two and have from the nobility of one now degenerated into the treachery of the other. Massive crackdowns on the opposition, belligerent Sultanism, and many other reasons indicate that this ghastly regime is headed for the dustbin of history. And yet when the first bomb is dropped on Iran, this entire nation will be united under those bombshells, precisely when these postmodern Fifth Columnists from Washington DC to Los Angeles will jump on their SUVs, hit the nearest highway and run for cover. Who now remembers Kanan Makiya, Ahmad Chalabi or Fouad Ajami? Their ignoble names, which incited violence against Iraq, are now forgotten for good reasons. I want to live – and if I am to die for something, I wish to die voluntarily and for my own ideals, and I wish to emphasise that I can only decide for my own life, and not for 25 out of every 1000 Iranians [an estimate of how many people will perish if a military strike were to happen]. I wish to know for what and for whom I die. Neither the US, nor NATO, nor indeed any other coalition with no matter how many flags on top of it, authorised by I could not care what organisation, has the right to impose on me as an Iranian living in Iran any "humanitarian intervention". I could not care any less if these bombs were guided by laser or by God Almighty Himself. I refuse to accept the risk of being among 25 in each 1,000 who shall die, and you sir [addressing a militant military interventionist heralding from NED] so long as the chance of your being among these 25 is zero – because you live in Washington DC and from each side of your location you are safely distanced from here by an ocean and a couple of continents – please keep your opinion to yourself about me and people like me who live in Iran, and kindly do not add any more fuel to the fire of foreign invasion. That is all. "Iranian political culture is molting." The rise of these postmodern Fifth Columnists is actually a positive development for the future of democracy in Iran – for all the delusions of a false solidarity among the dissidents in and out of Iran is actually dissipating and clearer bifurcations are emerging. Illustrious figures identified with the Washington Institute for Near East Policy, the Bush Institute, and the National Endowment for Democracy are now championing a solid alliance with the Zionist-Neoconservative forces in the United States, even to the point of enticing them to attack Iran to liberate it for them. We have (dare I dream) the solid foundation for the emergence of a new Left from the ashes of the Reform movement of the 1990s, from which a few progressive forces have been salvaged. The rest have either returned to their mysticism, or joined the Fifth Columnists, or dropped all their protestations and joined rank with the emerging Left. These divisions will not weaken the dissident voices. They will in fact strengthen the democratic future of the republic that will, willy-nilly, succeed this belligerent theocracy. Iranian political culture is molting. My only recommendation to active members of these Fifth Column brigade is to take a look at the fate of Kanan Makiya (aka Samir al-Khalil), who was equally, if not more adamant, in encouraging the US to invade Iraq to liberate it. Half a decade later, in 2007, his homeland in ruins, hundreds of thousands of his fellow Iraqis perished, Makiya was in agony acknowledging the horrors of his mistake when the New York Times had him reflect on his cheerleading the US-led invasion of Iraq. "In the buildup to the Iraq war," the Times reported, "Makiya, more than any single figure, made the case for invading because it was the right thing to do – to destroy an evil regime and rescue a people from their nightmare of terror and suffering". Even back in 2007, when the full scale of the Iraqi carnage was yet to unfold, the New York Times had concluded: "Now, of course, those dreams are gone, carried away on a tide of blood. The catastrophe in Iraq has thoroughly undermined the idea of democratic change in the Middle East. It has undercut the notion … that American military power can achieve humanitarian ends. And it has made Makiya and the others who justified the invasion look reckless and naïve." Others may, of course, use more accurate adjectives than "reckless and naïve". For the Iranian versions of Kanan Makiya I have generously opted, for now, for "postmodern Fifth Columnists". Having said all of this, it would also be unfair and inaccurate to dismiss all those who have sign on to this "humanitarian intervention" business as heartless warmongers who do not care about their homeland. More than three decades of a terrorising and criminal theocracy with no regard for human decency has driven many Iranians to desperate measures. Thousands of Iranians have been cold-bloodedly murdered in the dungeons of the Islamic republic, hundreds of thousands have perished in a prolonged and wasteful war, millions have been forced to leave their homeland and endure the indignity of exile, and an entire nation is terrorised into submission to a vicious, corrupt, and subhuman tyranny. Two years ago masses of millions of Iranians poured into their streets demanding their civil liberties – and they were met with vicious and wanton disregard for human decency. Millions of Iranians around the globe, proud of who and what they are, wish to go back to their homeland, join their families inside Iran and build a better future for their children – and yet this plague called "Islamic Republic" is cast upon that nation with wicked tenacity. But precisely for these reasons, rushing into a military option code – named "humanitarian intervention", and over which these exiled Iranians have absolutely no control, is not the answer, because it will have catastrophic consequences in every conceivable way. Libya is Libya and Iran is Iran – these two countries have and will continue to struggle for their liberties in terms at once common to them both and yet rooted in two different immediate histories. No country is a model for another. But if war is not the answer – then what is? The answer is not hidden in the wooden box of any apothecary. The answer is in the emerging spirit of liberation now sweeping from one end of the globe to another, which in one way or another will also come to Iran. In social and revolutionary uprisings, activists do not have the luxury of picking and choosing models, so they can opt for the Libyan as opposed to the Tunisian model. The logic of social movements are embedded in their own historic roots. An employee of NED, or WINEP, or the Bush Institute, or an obscure college professor in California is not in a position to pick and choose that model for a democratic uprising halfway around the globe. Not even people closest to the social uprisings, suffering in the dungeons of the Islamic Republic – not even Karrubi and Mousavi, who are on the record as having garnered millions of votes of Iranians, can decide and determine in what direction the Iranian democratic uprising will go. That democratic uprising – rooted, real, enduring and determined to succeed – will find its own way. Our task is not to impose a method on it, but to discover and exacerbate its inner logic. The everlasting embarrassment (indeed shame) will remain for those who fail to listen and learn that logic and wish to impose their own desires, however noble or treacherous. Neither the Islamic Republic nor any other tyrannical – or even democratic – state has the right to develop weapons of mass destruction, at the mercy of which our fragile globe lives in fear and trembling. But the current configuration of regional and global power has no moral authority whatsoever to tell the Islamic Republic not to develop nuclear arms. In one way or another the Islamic Republic will develop nuclear weapons capabilities – and there is very little that the apartheid Israeli garrison state sitting on hundreds of nuclear bombs and refusing even to sign the Nuclear Non-Proliferation Treaty can do about the matter. Whatever Israel and its US and European allies do will, in fact, expedite that eventuality. If they leave the Islamic Republic alone, it will get closer to that capability. If they attack it – and indications are that in physical and cyberspace warfare they have already done so – they will in fact push their project forward. This paradox can only be resolved by a resolution of the supreme hypocrisy of Israel and the US finger-pointing at the Islamic Republic about its nuclear program. The Islamic Republic and the Jewish State are now staring each other down like two thuggish cowboys – and the fate of one has become contingent on the other. Israeli Defence Minister Ehud Barak fancies Israel "a villa in a jungle" (the racist implications of his favourite metaphor defies sanity). But from the vantage point of the natives of that "jungle", both the Jewish State and the Islamic Republic appear as two garrisons destined to dismantle each other – for good, for the benefit of Iranians and Israelis, Palestinians and Arabs, Muslims and humanity at large. Whether or not that paradox is resolved, neither the Jewish State, the Islamic Republic, nor indeed the Christian empire presiding over them both can or will escape the force of history coming their way. We may call it Intifada in Palestine, Tent Revolt in Israel, the Green Movement in Iran, the Arab Spring in the Arab world, Indignados in Europe, or Occupy Wall Street in the US and around the globe, but against that force all hypocrisies and all paradoxes will sooner or later dissolve. The natural habitat of ordinary people revolting against all forms of injustice and tyranny is a moral and not a military position. Those who encourage war by way of offering political justification for it have categorically abandoned that moral position. They have aid and abet acts of violence, at the receiving end of which live masses of millions of innocent and helpless human beings, over which they have no control, against which they have no protection – and yet beyond which they must imagine and achieve a better and more just world. Hamid Dabashi is Hagop Kevorkian Professor of Iranian Studies and Comparative Literature at Columbia University in New York. Among his most recent books is Iran: A People Interrupted (2007).